I have just picked up 3 of my quilts from Annette @ Wildcotton Ltd.
We chatted about what patterns to use, batting selection and what colour threads would suit each quilt. So now that all the lovely quilting is done (thanx Annette!!!) I will need to get on with the bindings this weekend. Our Monday Modern (MM) quilt group has got increasingly more prolific as the year has progressed. Each month we all make a block for the next person on the list. I have just completed this months Bee Blocks - A Wonky Log Cabin block in solids for Cris and a Square within a Square sort of block for Lousie using a Tula Pink fabric as the focus. See the Monday Modern Quilt group for latest pics. The hottie cover can be simple or decorated depending on the fabric used and is very quick to put together. I have cut up a lovely tartan woollen blanket I purchased from the local Salli Armani shop the other day. The only question now is, what am I going to do with the rest of the blanket???? The Marcelle Medallion Quilt has been on my to -do- list since buying the book by Alexia Marcelle Abegg. I had a little pile of leftover old Liberties and have recently purchased some more from newer ranges - Liberty Lifestyle & Bloomsbury. I 'll add other cotton prints of course to these Liberties to get a scrappy feel, aiming for a pink/teal/grey overall look when finished. I guess I could throw in just a wee bit of red to help give depth to the pinks, but no orange and no white fabrics as it may make it all look a bit stark. That's the plan anyway, but as we all know, things change/evolve as we sew !!!! 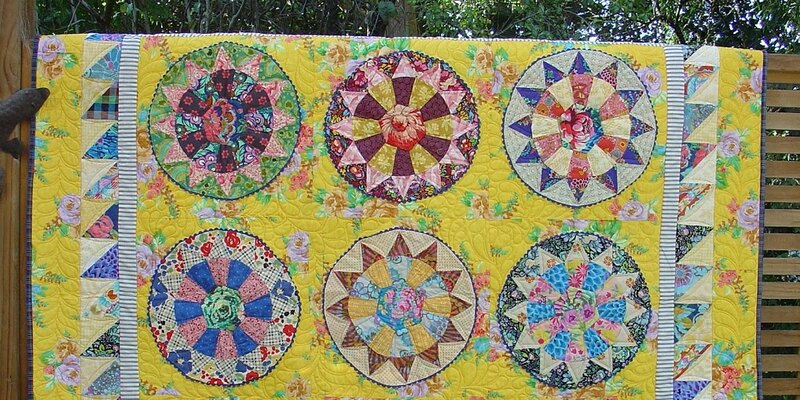 The centre star is pieced and quite vintage looking, and then there will be ten rows of borders. I must admit the centre block was just a bit tricky (make sure you cut accurately & mark the pattern pieces!!). It's made in 4 quarter units so by the time I got to the third quarter unit I was easily recognising the various pieces, and it's amazing what a bit of ironing does!!!! I ended up with the correct size block so that was a little bonus in life!! The "master plan" was to have a few projects in mind & a fabric stash all ready for when I retire & am not getting an income any more (!!! ), but they keep on bringing out new fabric collections!!!!! So I keep sewing!!!! Patchwork fabrics are certainly much more glorious & diverse than years ago and even with this very simple quilt layout, the end result will please one certain person I know that for sure!!!! I have used a combination of Denyse Schmidt fabrics, old & new, along with matching solids & it all co - ordinates with a larger piece of Valorie Wells/ FreeSpirit that I had & will use for backing fabric. Understandably there are some quilts that you just can't part with, but this particular quilt has someone's name on it already, & it still needs to be quilted !!!!! 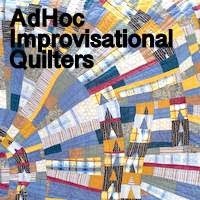 What do others do with all their quilts? Having a few things on the go at once seems to be my thing at the moment - some would say I shouldn't have cut down my hours at work!!!!! I came across this easy Blocks & Stripes Quilt @ http://filminthefridge.com/tutorials/ and, always on the look out for ways to use up some of my favourite scraps, I decided to have a break from the retro flowers. I hope it works!!!! Fingers crossed. Over the past year I have been slowly collecting mis- matched Crown Lynn plates, dessert bowls & side plates. We use them daily & just chuck them thru' the dish washer. Onto patchwork............I have been wanting to make a retro flowers quilt for ages now, so I tried to draw up the pattern myself, but it wasn't looking too good!!! And then (thanx to the blogging network!) I found that I could simply order THE pattern!!! This morning was busy with a trip to the zoo with my granddaughter, but once back home I thought I'd give it a go however, it wasn't quite as simple as I had hoped!! ......You need to cut right & left face pieces, always cut a single layer at a time (I didn't read this bit initially!!! ), then there was some flipping of the template involved, and then sewing together was a tad tricky too 'cos I had too many of the same directional facing units!!!!! But I got there in the end, and I do love the finished block . - only 39 flowers to go!!!! Some time ago I purchased a fat quarter bundle over the internet of "Floressence"/ Art Gallery Fabrics from the Fat Quarter Shop and once they arrived I just couldn't think what to do with them. The fabric felt lovely, the colours were ok, if just a bit too bright!!! I wondered about combining them with other fabrics. I wondered about throwing in some solid fabrics. I wondered about making a scrappy trip-around-the-world quilt, about making the "X" & "+" quilt, even about the more recently popular Retro flowers kinda quilt. ........but I couldn't decide anything, so I didn't do anything!!!! Until today......once I stopped looking at the fabric pile and actually started sewing, using a very simple pattern, it came together very easily. I love the rose print and teamed up with the geometric modern prints it all seemed to have a kind of vintagey mismatched appeal! !